Understanding your current energy consumption and your current cost of energy is part of making an informed energy decision. This worksheet will help you explore the types of energy you currently use and the current price you pay. Electricity in the home is primarily used to power lights and appliances (56 percent), condition air (22 percent), and heat water (9 percent). 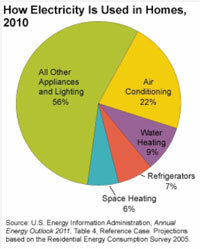 Roughly 39 percent of total United States electricity consumption in 2009 was residential. Demand for electricity has grown over the long-term, however, the growth has slowed progressively each decade since the 1950’s. In the 1950’s, demand increased by 9 percent per year, compared to the 1990’s, where demand increased by 2.5 percent per year. From 2000 to 2009, increases in electricity demand averaged 0.5 percent per year. Demand growth is projected to be approximately 1 percent per year through 2035. (EIA DOE, 2011). In agriculture, electricity is used for irrigation pumps, indoor and outdoor lighting, grain drying, powering farm shops, and livestock water systems. Average consumption in agriculture is difficult to determine because of the many and varied types of agricultural operations. If trying to determine total consumption and price of electricity, agricultural operators need to pay attention to whether demand charges have been assessed when reviewing statements. 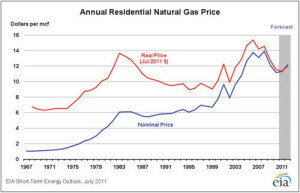 The U.S. Department of Energy’s Energy Information Administration 2011 Short Term Energy Outlook provides some historical context for understanding electricity prices by comparing the nominal to real prices overtime. Nominal prices are the actual price paid in a given year. 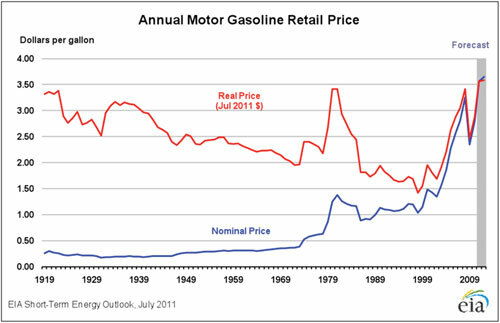 Nominal prices are adjusted to account for inflation to generate real prices (in current dollars). Real prices are generally a more useful way of evaluating prices. Use the following table to record information about your electricity. 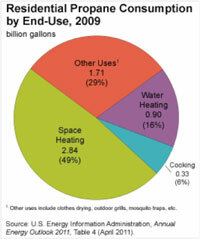 Natural gas is most commonly used for heating. More than half of single-family homes in the United States use natural gas as the primary heating source. Because natural gas is typically delivered through a pipeline, it is not commonly used in agricultural operations. The price of natural gas paid at the residential level will vary based on the supplier, type of contract, delivery costs and other factors. However, the EIA data shows that, while price of natural gas has declined in the past several years, the real price has trended upward over time. My Natural Gas Data Use the following table to record information about your natural gas consumption. Use the following table to record information about your natural gas consumption. Propane is a liquefied petroleum gas. It is found mixed with natural gas and oil and is separated in the refining process. In the home, it is used for space heating (49 percent), other uses (such as clothes drying, gas grills, etc) (29 percent), water heating (16 percent) and cooking (6 percent). Agricultural operations may use propane. Some examples might include livestock barn heaters or water heating in dairy barns. Because propane is linked to petroleum extraction and refining, propane pricing follows petroleum pricing. 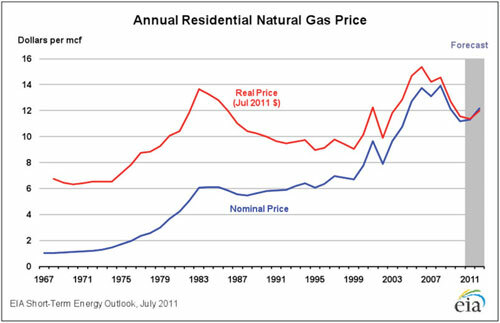 Like natural gas, the residential price will fluctuate due to delivery costs, storage, forward contracting and other factors. 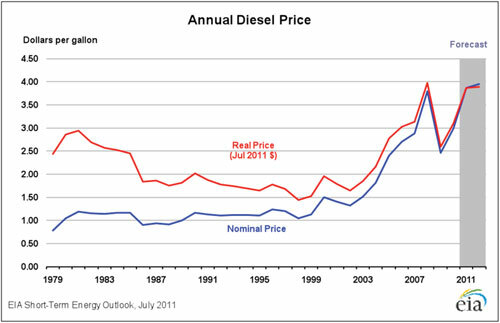 However, like other petroleum products, the price has escalated, especially in the past five to seven years. Another petroleum-based product used for heating is heating or fuel oil. Its use is less common in the Rocky Mountain region, but some homes do use heating oil. 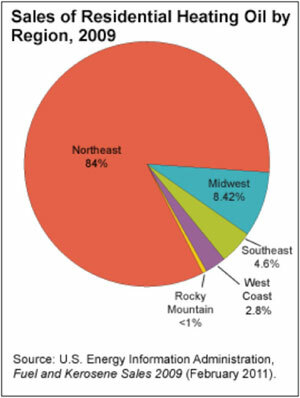 The Northeastern region uses most of the heating oil in the United States. 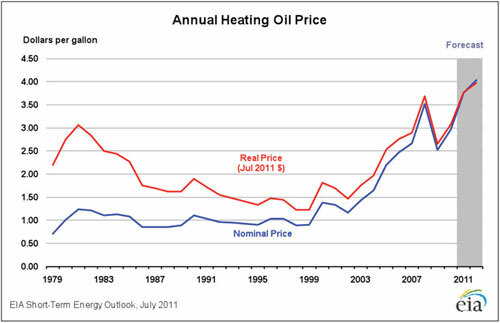 Prices for heating oil trend with petroleum. Use the following table to record information about your heating oil consumption. In the United States, petroleum is our number one source for transportation fuels. Personal vehicles account for most of that consumption. Prices for transportation fuels, both in real and nominal terms have escalated significantly in recent years. Use the following table to record information about your transportation fuel consumption.